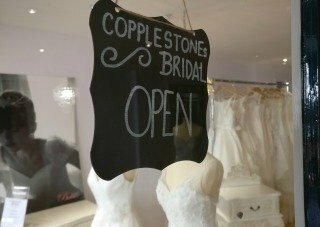 Copplestones - Liverpool & Chester - over 500 Wedding dresses from £99 – Cheap prices but high quality. For wedding dresses, bridesmaids & more. Book an appointment at our Liverpool store by clicking through to our booking system. If you would prefer a private appointment please ring us and we’ll arrange a quiet time to suit. Our fantastic appointments system is designed with you in mind so you have a dedicated stylist to look after you and help choose your fabulous gown for the duration of your one hour appointment. To book into Chester store, please click here or call 01244 400 876. Later appointmnts available on Thursdays, please ring to book. From Moorfields: if you arrive at Moorfields Station, make sure you take the Moorfields exit (not the Old Hall Street exit), walk down Moorfields to Dale Street and turn left. Turn right on to Sir Thomas Street just before the City Council Municipal Buildings and we are the last building on the right, just before the Sir Thomas Hotel. By Car If traveling by car there is ample parking with pay and display on Sir Thomas St and a large Car Park just opposite off Victoria St.